It is very well said, that to be alone or to experience the feeling of loneliness, it is not necessary to be alone. Even those who are in relationships feel alone despite being with someone. Valentine’s day is celebrated as the day when love paints the world red. We see beautiful cards, personalized gifts and the most important companion of valentine’s day the roses everywhere. But do you really think that love should be expressed and celebrated on only one day out of the 365 days which we have? Moreover, the irony of this is that there are many breakups that happen after valentine’s day. Wondering wy? Well, cheating and lying is the culprit for this. Being single is considered as a bane. If we come across a person who says that he/she is single, we often make a sad and sympathy face for them. Especially, when we have a single friend on valentines. He/she becomes the hot topic to speak about. Some even try to find their true love before Valentine’s day so that they also can enjoy the day to the fullest. But those who are single have a different story to say. Being Single o Valentine’s Day is Super cool and not sad for many reasons. 1. Your wallet will not suffer: On Valentine’s day taking your valentine out for dinner, movies, plays, shopping etc is very common. You have to shower them with gifts which will equate your love for them. What worsens this scenario is the uncertainty of the relationship after Valentine’s day. What if your valentine breaks up with you after all this? Being sad later will not help. So, when you are single you don’t have to waste your money on such things. Rather you can save your hard-earned money and use it elsewhere. Probably where it really should be spent. 2. No Planning = No Stress: You don’t have to spend your time thinking about how to plan Valentine’s day. While you plan something for your loved one, how can you be so sure that they will like it? After someone plans the entire grand date for their valentine, them not liking it is the worst part. Hence, being single on valentine’s day spares you this pain !! 3. The freedom of doing what you love: Valentine’s Day is celebrated by spending the day according to the one you love. You need to keep aside your personal favorites and make your partners ideas yours. Even if that is not your happiness, you have to be happy because they are. Single’s don’t have to do this sacrifice! They can enjoy the way they want and do the things which make them happy. So all that money which you spend will end up bringing a huge smile on your face and a sense of contentment in your heart. 4. Have a super fun day with your single friends: If you don’t have a valentine, that’s really okay. You can celebrate the true love of friendship on this day. Call your single friends and spend time with them. People in relationships often don’t get enough quality time with their lovely friends. You can go for a dinner with them, talk about each other’s lives, discuss career aspirations or just have a jolly good time !! This is more fun because you know that your friends are there forever! 5. Host a Party for the Single’s in Town: You can celebrate the feeling of being happily single with all the others on valentine’s day. Host a party especially for the singles. On Valentine’s day, we see party and events which are only for the couples and people in love. So by being the host of a party for the single’s, you can actually turn the tables round and give the day a whole new meaning. 6. You don’t need to dress to impress: If you feel comfortable in sweatpants and a pair of T-shirt with your favorite cartoon character on it, then well you can wear this on Valentine’s day. You don’t have to wear something which will impress someone else. Your fashion statement will be the one which makes you feel more U. You can decide your dress for the evening without having the interference of someone else in it. This also saves you the money of buying a brand new classy looking dress, especially for Valentine’s Day!! 7. Get saved from being cheated on: People tend to get into relationships just a few days before the Valentine’s so that they too can enjoy and celebrate the day of love. They feel that they have finally found their forever love. But sadly this is not true in all the cases. Not everyone is lucky to have found love on or before valentine’s day. This leads to many break-ups due to cheating and other reasons. So, if you are single it is better than falling prey to the circumstances of being with the wrong person. Best Way To Celebrate V-Day Even If You’re Single And Leave Your Assignment To AssignmentFirm.com! Now don’t need to sit and complete your assignments if you’re single on Valentine’s Day? Enjoy this V-day to the best by giving us the responsibility of your assignment. While you have party and fun with friends, our writers will work on your assignment and deliver plagiarism free assignment help. Our Assignment Help services are pocket-friendly, and you’ll get your assignment on time. You can get all details on a single call at +61 36 387 7039. 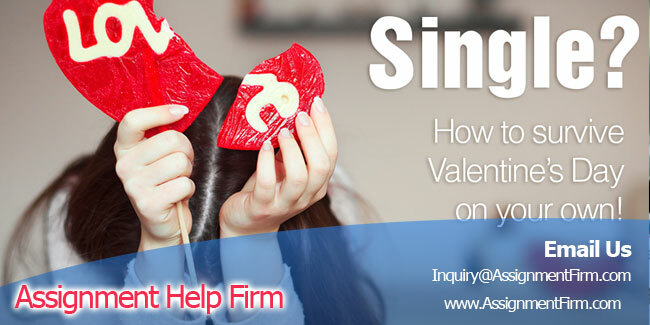 There can be many more reasons why you can celebrate being single on valentine’s day. You just need to love yourself they way you are. Your relationship status will not certify the kind of person you are. If you are single, it is not necessary that you will be sad and your life has nothing great going on. Single’s have the freedom of loving oneself to the fullest!! Always remember that you can never be sad with your own being. So, this valentine’s if you are single, then there’s nothing to be sad about!! The above reasons are all you need ! !